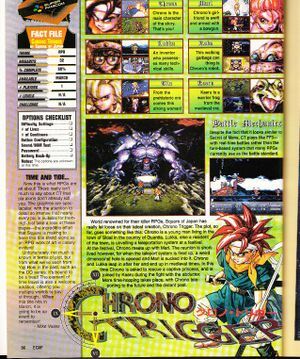 This page details one or more prerelease versions of Chrono Trigger (SNES). We apparently have permission to take info from Compendium. Chrono Compendium. 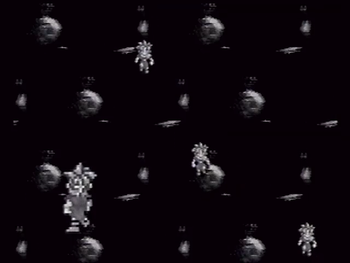 This is the absolute earliest footage of the game; the infamous "weird overworld" proto shown in a V-Jump Preview VHS video from [when!!!] 1994. The game is clearly in a much earlier state than the dumped prototype. 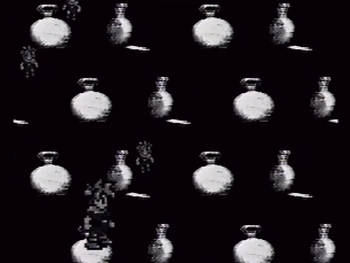 This intro displays a bunch of spinning and walking early Cronos over a weird spinning CG pocket watch background. Assumedly this was something like the original title screen or game intro, but it's impossible to tell. It could very well be something made for the presentation. 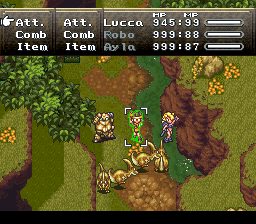 Immediately noticible is that Crono has a completely different, very rough (and rather poor) sprite set, with flatter hair and a very pronounced bandana. 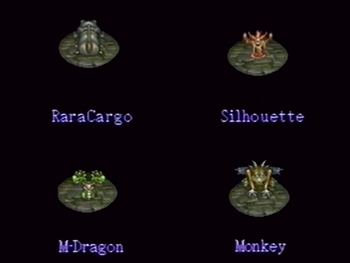 the cartridge proto's names for these monsters. Notable are these monster lists, because they display monsters with names and appearances not exactly in line with the final. Orphon's (Bullfrog in the English final) palette is brown and not green in the final. The "Croaker" enemy is green instead. 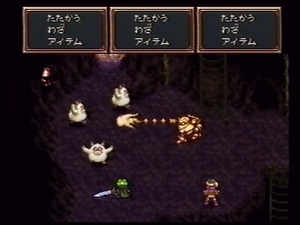 Note that the frog inflates and then pops during the animation. "Tatta" seems identical to the final. "Mage" is known as "ジールメイジ" (Zeal Mage) in the Japanese Final. This is accurate for the English final, though. Bug's palette is green (which is close, but not identical, to the "Beetle" palette swap in 1000 AD). It's blue in the final. The Raracargo (Hexapod) uses Krawlie's palette. The Silhouette (Shadow) uses Acid's palette. There is only one of this type of enemy in the final, it's called "Twin Bite" or Ruminator, and has a black palette, not green. The green palette is at the very least unused in the final. There is a green version of this enemy in the DS port, but it's not the bright green shown in this screenshot. Monkey, or "Santana"/Cave Ape, seems identical to the proto. The font here seems familiar. It looks like Super Mario RPG's English font. 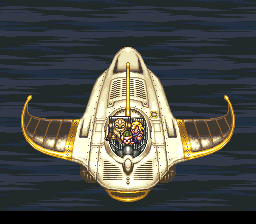 The Epoch was also shown, looking mostly identical to the final Epoch, with the exception of the rear vent, which would raise and fall, and a glowing, rippling shield representing the glass dome over the cockpit (which is oddly absent in the final). Interestingly, both positions are used in the final, but it is never seen animating from one position to the other. Also note the trails on the rear of the machine, and the repositioned laser cannons or whatever in front. Battle scenes shown in action. Ayla no longer has that frame of animation in the final and seems to be in a rough state as many other playable characters; none as rough as Crono, however. The general theory here is that because the Lucca and Robo move (Fire Punch) is incomplete in the Proto, that this footage is either staged, or the entire battle system was scrapped at some point. Probably the former considering how uniform and choppy the timing on the animation is. 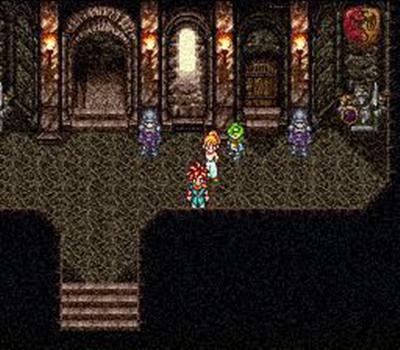 After the presentation, during the developer interview the party, which includes Crono, Ayla and Robo, move around on the overworld on the projector. 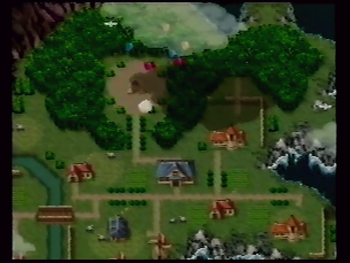 As they pass near a bridge, a location name is shown very briefly (which is very difficult to read). 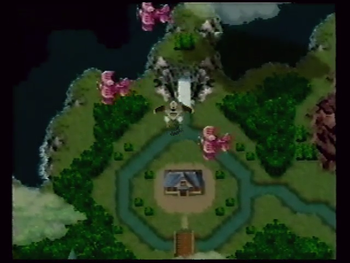 The interesting thing here is that not only is the overworld functional enough to have location names and overworld sprites, but the bridge is also programmed with entrances on both sides similar to Zenan bridge. This is also the only real instance of in-game text in the entire presentation barring the probably-simulated battle sequences. 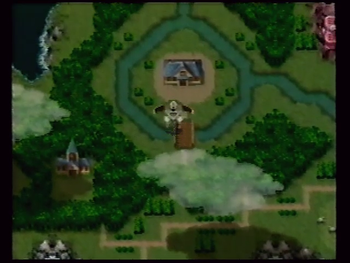 Later, the Epoch is shown flying over even more land on the 1000 AD overworld. A second video was released in 1995, shortly before release(?). This video contains footage of a version of the game that is clearly not the final, and actually seems to be earlier in development than the Prerelease. The prism cards were prerelease merchandise that happened to have (relatively) high-quality images of game mockups on them. Unknown source, possibly a mockup. This depicts the storeroom that appears in 1000 AD after you finish the Rainbow Shell quest. Except, uh... Here it's in 600 AD, where it isn't supposed to be built yet. It also isn't supposed to have a freaking door on it, either. A preview taken from a Brazilian magazine. Notably includes a new 2300 AD image, but also has one of the only instances of a primitive menu screen! 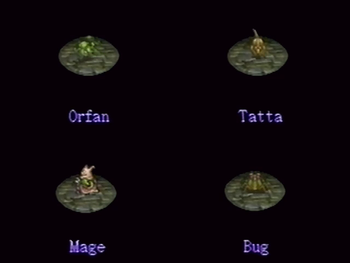 This displays Crono with what appears to be four elemental symbols with values assigned to them. What they were intended for is unknown. Earliest proto. The center screenshot is new and depicts an early sprite for Schala and Janus at a primitive Mammon Machine in the Undersea Palace (?!). Most likely a mockup. This EGM2 preview uses mostly the mockups used on the Prism Card mixed with several new ones. The version depicted seems to be earlier than the prerelease but later than the earliest proto. 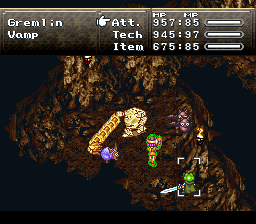 For example, in the Dragon Tank shot the menu is using very long status display not seen anywhere else. 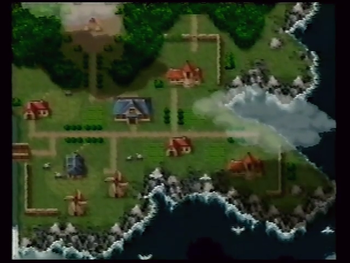 The first image in particular claims Crono is from the town of "Stoal" instead of Truce. 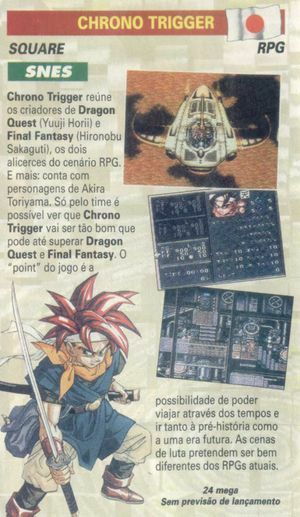 The second image is even more interesting, showing a newer, unfeasably compact 1000 AD overworld mockup, a scene showing the Arc Impulse triple tech in an odd, snow mountain mockup area (which may have been the inspiration for the Toriyama cover artwork or vice-versa), and three new screenshots. 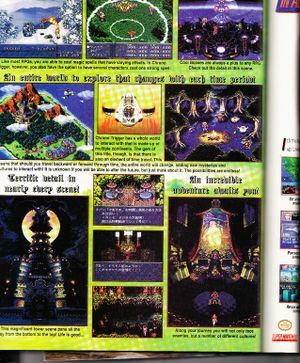 These show the Telepod scene (with what appears to be a slightly different Taban), one where the party speaks to a Goon enemy in Manoria Cathedral, and a bizarre Earthbound Village mockup. The upper-right screenshot on page two also shows a bizarre fight with a completely different, larger Queen Zeal, while the upper-center one shows yet another triple tech mockup. 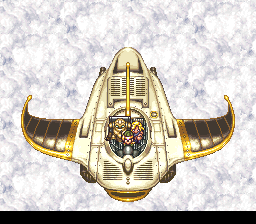 It sure as hell doesn't look like "Twister", the Crono/Robo/Ayla triple tech in the final. 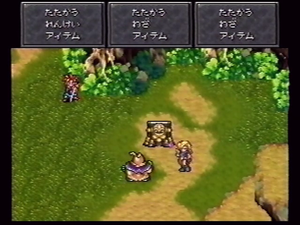 It also doesn't resemble any double tech of Crono/Ayla's considering Robo's command window is open!